Posted on Thursday, July 3rd, 2014. The challenge remains – how to keep your email marketing subscribers. Will the next email message result in a large amount of unsubscribes? This is a real fear for marketers. 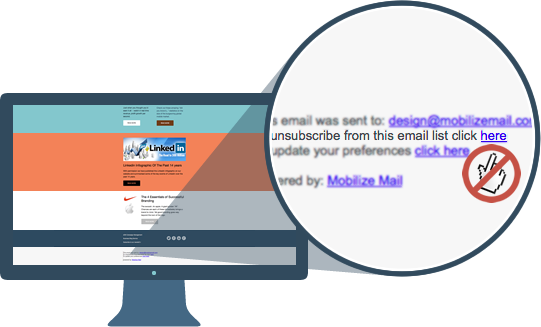 There are steps your business can implement right now to slow the unsubscribe rate down. Segmenting Subscriber Data occurs ‘after’ you’ve collected the criteria needed to send targeted emails to your email list subscribers. The collection of this information usually occurs on the email list sign up form. See our Email Sign Up form here. We are collecting just the first name and email address. However your business can collect a lot more information – see this email sign up form example. This business is collecting the region the subscriber is in and can then send targeted eDMs to subscribers in a particular region. Have a look at your email list sign up form now – are you collecting the data you need to send targeted eDMs? When the subscriber data is in your email marketing account; email list segments can be determined and set up so your business can deliver eDMs to specific subscribers that match your eDM message criteria. For example your business may have a special deal on a product for a specific industry and instead of delivering the eDM (email marketing message) to all your email list subscribers; you can select to deliver the message to just the subscribers in that specific industry. Targeting your eDMs results in less recipients receiving the eDM and less unsubscribes. If your email account is with Mobilize Mail we can provide support to get your email list segmented. Reviewing your eDM statistics provides your business with feedback. We recommend reviewing the eDM click statistics – to assess the performance of articles in your newsletter. Which articles were the most popular? If your email account is with Mobilize Mail you can create a segment of email subscribers based on the links they click in an eDM. You can also create segments of email subscribers who took no action too. Your business can use these segments immediately or later on to send targeted emails. Offer Opt-In Choices – allow your subscribers to select the type of communication they receive from your business. For example: weekly updates, monthly newsletter, special deals. This strategy puts the power with the subscriber and they are less likely to unsubscribe when they can ‘manage’ their subscription and control the communication they receive. The earlier example of a sign up form has two lists so the subscriber can choose the type of information they wish to receive from the business. Asking for feedback is vital when developing new services or changing the direction of your business. Seeking to understand what your email subscribers like and then providing information to meet their needs will keep them engaged and subscribed to your email list.